What games do you want to play this GGG? The Gotham Gaming Guild is back! > Do you miss playing RPGs that last longer than 1-2 games? > Are you looking to make new friends to play games with? > Do you need a conveniently located space to game in? > Play games! Make friends! Trouble logging into NerdNYC’s forum? 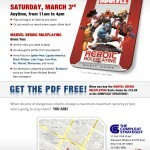 MARVEL Launch Party - Saturday, March 3rd: Manhattan! Next post: RECESS January 2011 – HUGE SUCCESS!